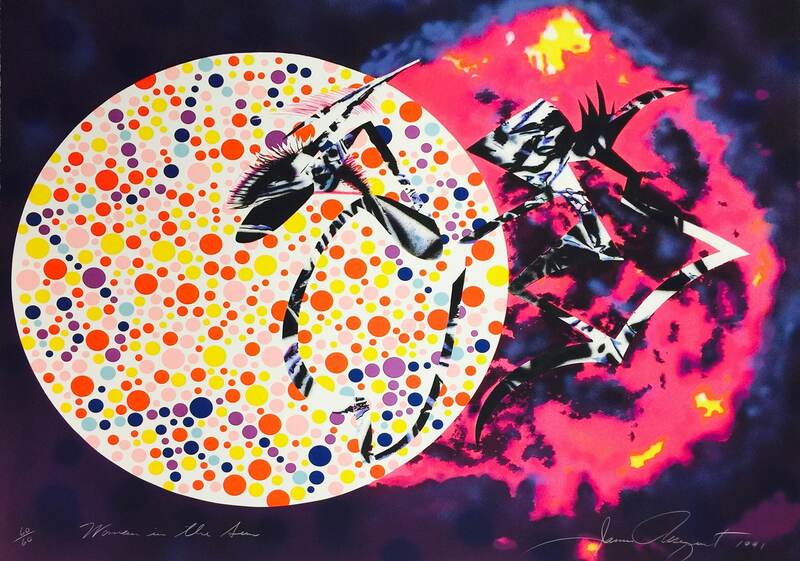 James Rosenquist (born 1933) is an American Pop artist originally from North Dakota. Rosenquist’s contemporaries include artists like Claes Oldenberg, Andy Warhol, Robert Rauschenberg, Roy Lichtenstein, and Jasper Johns. Rosenquist, a master of Pop, was influenced by commercial art and mass produced goods. His works often burst with underlying storytelling and curious imagery. James Rosenquist was born in North Dakota. At a young age, he was encouraged by his mother to pursue art. Rosenquist went on to study art at the University of Minnesota. In 1954, Rosenquist created his first commercial billboard painting, and shortly after he attended the Art Students League on a scholarship. After graduating, Rosenquist became a billboard painter. This experience created a strong sense of foundation for his later artwork, which was often as large in scale like his commercial work. Rosenquist’s expression was often openly political, and his iconic image of the F-111 (from 1965), was a breakthrough statement for the artist. Today Rosenquist’s works are included in major institutions including The Art Institute of Chicago, The Corcoran Gallery of Art, The Whitney Museum of American Art, Tate Modern, The Rose Art Museum, The National Museum of American Art (Smithsonian Institution), The Museum of Contemporary Art (Los Angeles), The Guggenheim Museum, Bilbao, and the Solomon R. Guggenheim Museum. 1985 – Traveling Exhibition: The Denver Art Museum, Colorado; Des Moines Art Center, Iowa; Albright-Knox Art Gallery, New York; Whitney Museum of American Art, New York; National Museum of American Art, Washington, D.C.